Personal Details: George Henry McBride was born on the 3rd of December 1892 to parents Samuel and Catherine McBride in the Stanley Township, Huron County, Zurich, Ontario, Canada. He was the youngest of 10 children, with 5 brothers; Robert, John, Samuel, William and James, and 4 sisters; Catherine, Mary Ann, Margaret Jane and Maud. As a young boy he and his sister Maud would play around their farm and old house. Over the years he grew into a fair complexioned young man with blue eyes and light brown hair and by the time he was 21 he was 5 ft 10½ inch tall. Before he enlisted he ran the local feed store. 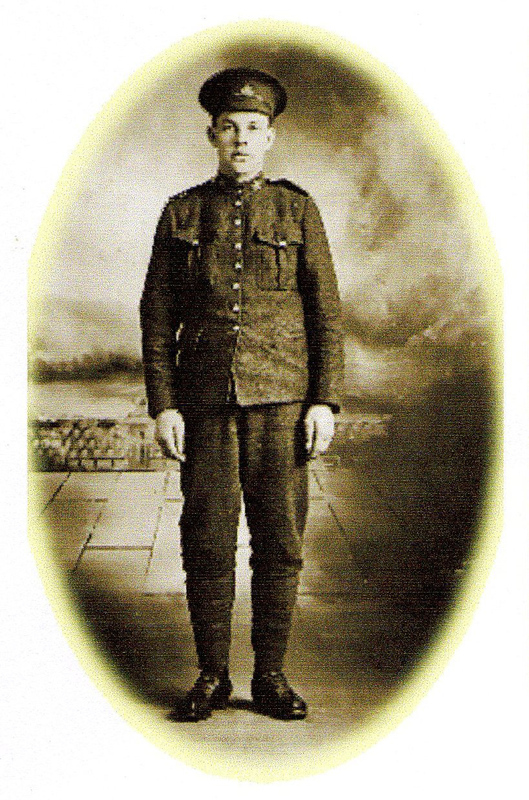 Enlistment Details: On the 20th of March 1916 George enlisted in the C.E.F. at Hensall, Ontario, Canada being assigned to the 161st Huron Battalion. He was 21 when he enlisted. Military Service: After his enlistment George remained at home until the 17th of May 1916 when he set off for training. He trained in Camp Borden all summer. During the June of the summer however George was unlucky to catch measles and was admitted to the District 1 Military Hospital in London, Ontario. He remained in hospital until he was fit enough to resume training at Camp Borden. In October 1916 George was notified about being shipped overseas, so on the 12th of October George left Ontario and took a troop train to Halifax, Nova Scotia. It wasn’t until the 1st of November that he headed overseas upon the SS ‘Lapland’. It took 10 days for the SS ‘Lapland’ to reach England, so on the 11th of November 1916 George landed in England. He was posted to the Shorncliffe Camp on the coast of Kent. During his time in camp he was reassigned to the 8th Reserve Battalion, awaiting further transfer. On the 19th of December the call up came and his battalion left Dover for France. As George set sail for France the troops were issued with a new uniform, rucksack and rifle. It wasn’t until the 29th of December that George and the other troops reached camp at Mont St Eloi where he was assigned to the 58th Battalion (Central Ontario Regiment) in the 9th Infantry Brigade. As part of the 9th Infantry Brigade George fought alongside 3 other battalions; 43rd (Queen’s Own Cameron Highlands), 52nd (New Ontario) and the 116th (Ontario County). Over the next couple of months during the winter of 1916-17 George and his battalion spent much time training and strengthening their defenses with Christmas 1916 being spend at the Canadian Base Depot. During the winter his battalion also spent more time conducting raids on German positions. Then on April 9th, 1917 the Battle of Vimy Ridge began. During the battle of Vimy Ridge the Canadians advanced under artillery barrage and managed to capture part of the ridge from the Germans and throughout the next 3 days the rest of the ridge would be taken, pushing the Germans to retreat 2 miles. The victory at Vimy Ridge was one of the C.E.F.’s greatest accomplishments but unfortunately the victory was not one that George lived to see. At the day’s end of April 9th George was reported missing. Three days later he was listed as killed in action. It was not until 2 weeks later that George’s body was found and buried where it lay, then 18 months later; on the 9th August 1919 George’s body was exhumed and re-buried in the La Chaudière Military Cemetery where it still remains today. Interesting Note: Although George sent many letters home to his family, many were censored and did not make it home to his parents. In one that did get through however he wrote of the lack of food that both he and the rest of the men had. After that letter food packages were prepared to send to the troops, but George would receive none as he was killed shortly after his letter reached home.